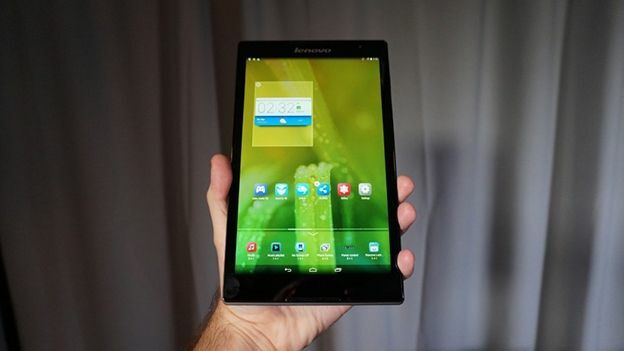 Lenovo has unveiled a new Android tablet, and boy is it thin. In fact, Lenovo's Tab S88 is almost as thin as Apple's Retina display iPad mini and Samsung's Galaxy Tab S 8.4. That means there's another choice in the market for those that absolutely have to have their tablets on the thin side. It's also light. It's lighter than the iPad Mini and almost as light as Samsung's Tab S.
However, one area where it won't leave you feeling thin and light is its price. According to Lenovo, the Tab S88 will sell for $199 (that's £120 in real money) – about half the price of the iPad Mini and Tab S.
Before you start worrying about where the catch is, its low price isn't at the expense of it being powerful. While it's not going to be competing with Apple and Samsung's tablets for power awards, it is perfectly sufficient for most tablet buyers. Also nice to see is that it comes with an unskinned version of Android 4.4 KitKat – that should mean you'll get Android L as soon as it comes out. It comes with a 1,920 by 1,200 pixel screen, 2GB of RAM and a quad-core Intel Atom processor. Camera wise it packs in an 8 megapixel rear facing camera. All in all, it's better specced than Apple's iPad mini in all areas except for its processor. That said, unless you're open to choosing an Android tablet, it's not really going to put too much pressure on Apple's device. It could – however – cause some sweating foreheads at Samsung.